To this day, the only pair of shoes that I’ve ever cleaned at least once a week is the Nike Air Force 1. Although it’s been a while since I copped a fresh set of these kicks, there really is nothing quite like the feeling you get from sliding your feet into a brand new all-white pair of the AF1. Well, until they get dirty at least. It was in 1982 that Nike designer Bruce Kilgore dialed up his creative mojo and developed one of the most iconic products in the history of fashion itself. It’s world renowned fame is so focused off the court that its origins as a high performance basketball shoe is hardly known by the vast population who wear them daily. It was after all the first basketball shoe to have a bag of air inserted into the heel for on-court cushion and support, which has obviously become of Nike’s staple concepts with Zoom Air and Air Max technologies having followed since. If you didn’t already know, aren’t you a bit surprised? Legendary poster of the first six. Having basketball roots, these kicks were definitely represented well through six old school players in Moses Malone, Michael Cooper, Jamaal Wilkes, Mychal Thompson, Bobby Jones, and Calvin Natt as they were selected to embody the six original symbolisms of the shoes (heroic/consistent/dominant/courageous/constant/pure). To commemorate 25 years of excellence for the AF1 in 2007, Nike revived and expanded this concept by creating “The Second Coming” campaign that featured the NBA’s top dogs (at the time) in Shawn Marion, Rasheed Wallace, Steve Nash, Amare Stoudemire, LeBron James, Kobe Bryant, Chris Paul, Paul Pierce, Jermaine O’Neal, and Tony Parker to endorse the Air Force XXV, a shoe that was made to pay homage to the original AF1. Okay, now, let’s get to the shoe itself. 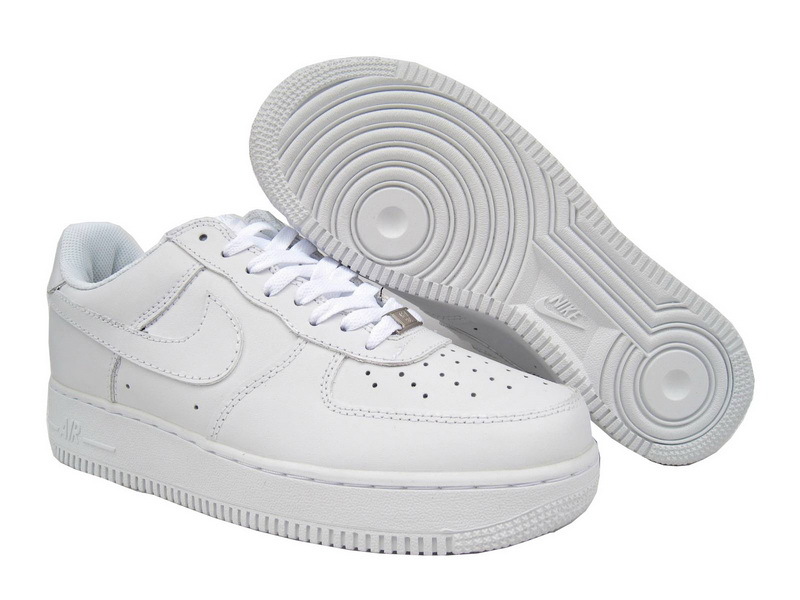 The Air Force 1 generally features a leather upper with a full rubber outsole. Right above the midsole, we see single-line stitching, which also rests above the “AIR” logo on the heel end. The Swoosh logo is on both the medial and lateral sides of the shoe which itself, is constructed of multiple panels that are all stitched together. With well over 1,700 different models in nearly 30 years of existence, the AF1 has seen more than its fair share of colorways and material combinations with certain specialty pairs even going for as much as $2000. Bottom line, the Nike Air Force 1 isn’t so much about the quality, which is exceptional with high quality comfort and cushioning, as it is about cultural style and substance. While there are low-top, mid-top, and high-top versions, I am personally a fan of the lows because like I said in the beginning, there’s just something about a new clean pair of all-white AF1’s that always devour my senses. These kicks are undoubtedly an all-time classic that boys and girls from all over the world have rocked at school, church, on the street, or at the park – and that includes you. Even so, it’s been a few years since I’ve bought myself a new pair due to the maintenance factor because frankly, I don’t have much time to spare towards cleaning my shoes. I must say though, talking about them is kind of making me want a new pair so “I can get to stompin’ in my Air Force Ones” ala Nelly. And just in case you’re wondering how insanely cemented these kicks are into the fabric of our globe’s street wear culture, the Nike Air Force 1’s rake in an estimated $800 mil a year in the U.S. alone. Yes, they’re that special. Scope the commercial for “The Second Coming” that features some of the NBA’s top superstars as they engage in a little “friendly competition”. Manny Pacquiao to wear Nike Kobe X for May 2nd?